Research on animals costs many millions of lives each year. And millions more animals are kept confined in laboratories and cages, awaiting their turn for experimentation. 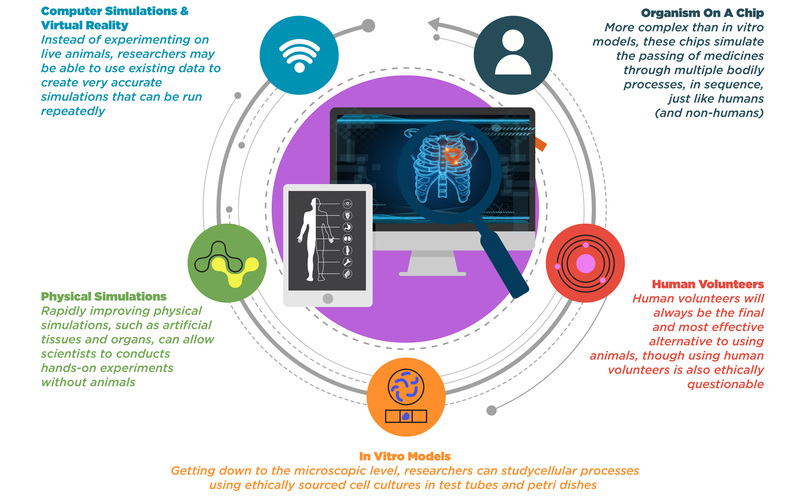 Biomedical research using animals is a largely secretive process and the public knows little about what goes on in research labs. This exclusive Faunalytics Fundamental examines the use of animals in research, estimating the scope and nature of the problem based on the best available data. We hope you find the information useful in your advocacy for research animals. Please see all the sources here. Animals live rich and complex lives. 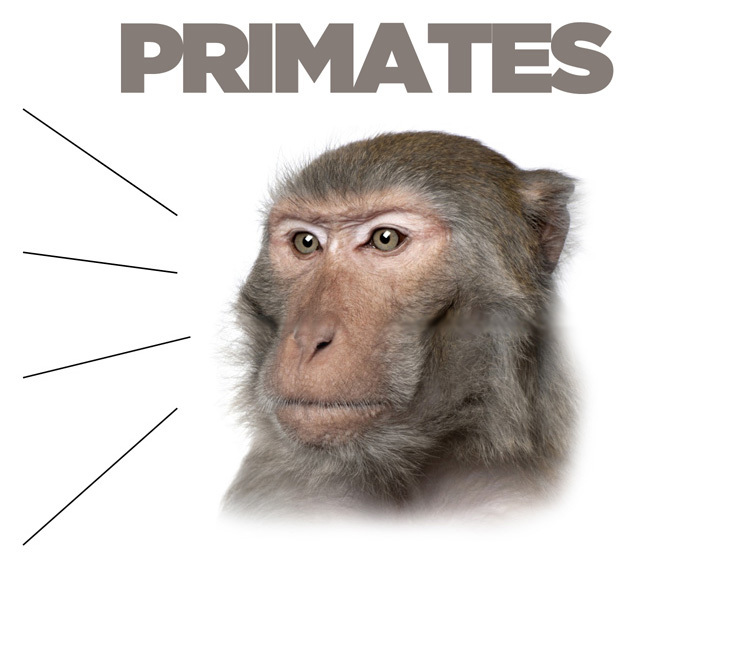 Primates exhibit deep thought and intricate social structures; their similarity to humans has made using other primates unthinkable for most purposes other than experimentation (and “entertainment”). 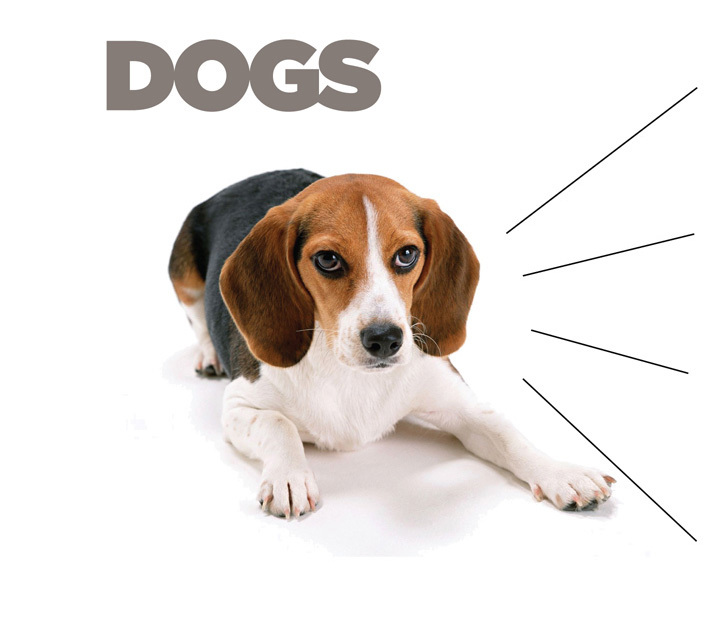 Dogs like beagles are docile, friendly, and cooperative – traits that make them easier to manage as test subjects. 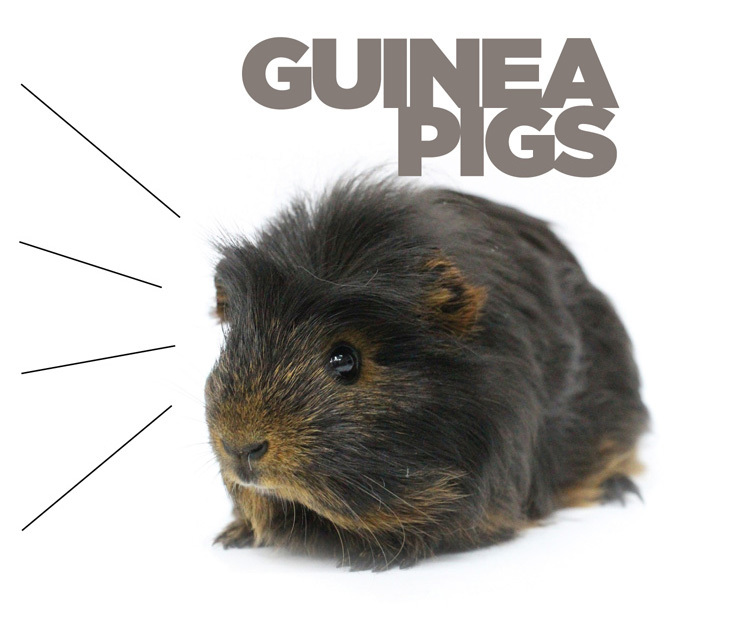 Guinea pigs, which have become synonymous with animal research, are gentle and even purr like cats when they’re happy. 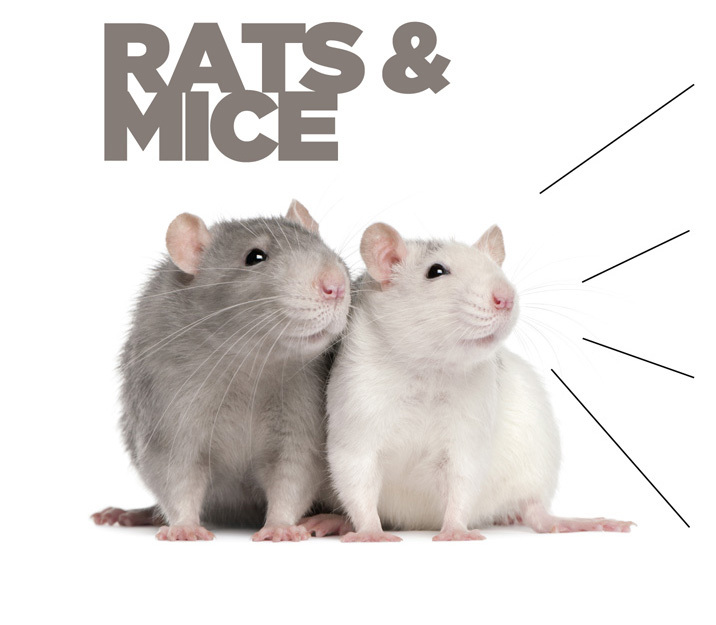 Mice and rats are empathetic and studies have shown that they will risk themselves to rescue cage-mates in captivity. There is no doubt that the animals we use for research and dissection are capable of thinking, feeling, and suffering just like we are. Check out the interactive graphics below to explore facts about some of the animals most commonly used in research. Of course, we’re only scratching the surface of what makes these animals unique, sentient, and deserving of their own rights to life and freedom. 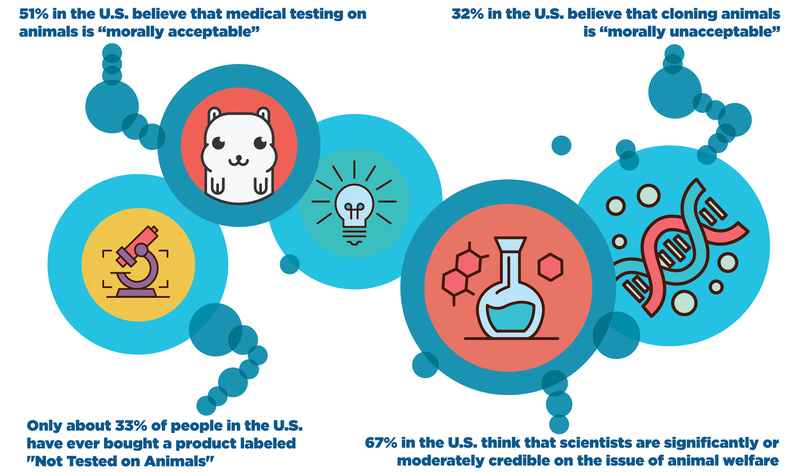 Opinions about the use of animals for research are complicated and often divided when it comes to different purposes or types of research. For instance, a clear majority of people are against the use of animals for testing cosmetics and personal care products. However, if the research is claimed to save or improve human lives, then opinions shift, even if those claims are hypothetical or baseless. Attitudes regarding the use of animals for student dissection are less clear given there are fewer surveys of those audiences. However, the limited research shows that many students and teachers prefer non-animal alternatives to dissection – see our “In The Classroom” section below for a detailed breakdown. What about trends over time? The Gallup figures shown in the graphic above have shown a consistent decline in the perceived moral acceptability of testing on animals. From 65% saying “acceptable” in 2001 to 51% saying “acceptable” in 2017 (a record low). Through our Animal Tracker survey, Faunalytics has monitored attitudes about animals used for research since 2008. In the selection of Animal Tracker charts below, you can see that feelings about the protection of animals in laboratories has fluctuated since 2008/2009, but only slightly. In summary, belief in the importance of research animal welfare has stayed strong, most people continue to question the adequacy of laws protecting laboratory animals, and belief in the necessity of animal research and dissection appears to be dropping in recent years. Before they arrive at the laboratory, animals used for research are most often born and housed in large breeding facilities found throughout the world. Some research animals may come from relatively regulated companies such as Charles River or Interfauna, based in countries like the United States, England, or Spain. 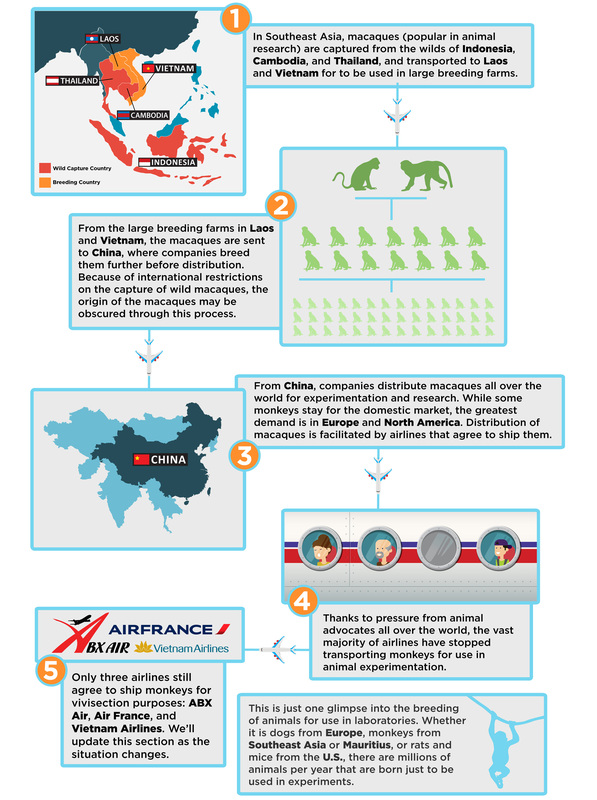 Other animals, such as monkeys, more often come from international suppliers that operate in Southeast Asia, parts of Africa, and China. Below, we connect some of the dots of the global breeding and transport of research animals, with Southeast Asia as an example. How many animals are bred for research, kept in laboratories, and used in experiments? Unfortunately, under current regulations in virtually any country, it’s impossible to know the exact answer. Estimates for the total number of animals used in research worldwide hover around 115 million to 127 million, while estimates for the U.S. specifically hover around 25 million. In the U.S., researchers are not required to report the numbers of rats, mice, and birds used in experiments, and these species combined make up an estimated 95% of all animals used in research. 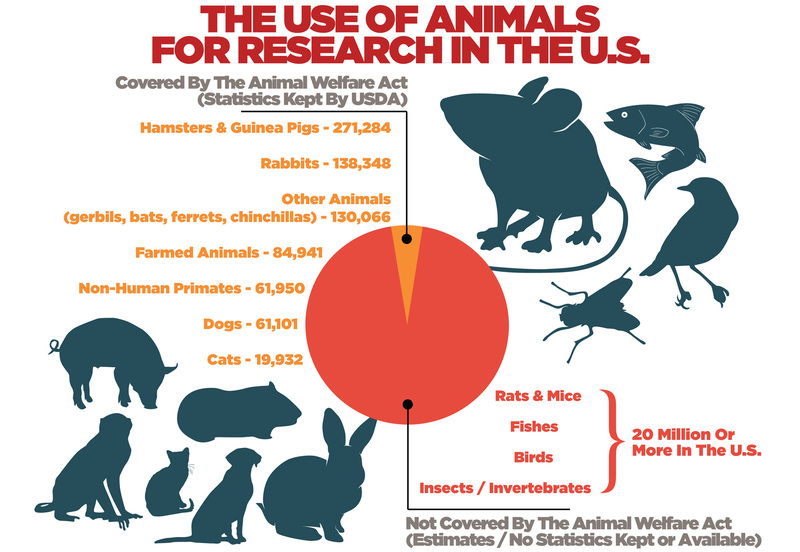 The chart below provides the best estimates for the numbers of mice, rats, and birds used in the United States in 2015, as well as the other species whose use is covered by the Animal Welfare Act. Immediately, we can see that the Animal Welfare Act is inadequate and ignores the big picture. Not only does the act not cover these animals, it also does not mandate that researchers maintain any statistics for these species. Therefore, we can only make educated estimates on the numbers of animals being used. Secondly, we see that researchers, who already keep hidden from public view, have very few official controls or oversight for most of the work they do. For animal advocates, it is important to spotlight these facilities and the often egregious suffering that they house. The above map shows animal experimentation labs and breeding facilities in the U.S. You can look up the animal research facilities in your state using this tool put together by HSUS. The prevalence of such operations throughout the country may be shocking to see. Unlike the farms and feedlots that we often see while driving through the countryside, animal research and breeding facilities are much more hidden from view. Likewise, the laws that govern and regulate experimentation in the U.S. (and many other places in the world) do their part to obscure both the scope and the nature of animal research. Support for dissection isn’t just dwindling. Students are actively demanding alternatives to the use of animals in grade school classrooms. In response, many schools have created what are called “student choice policies,” which allow students to opt-out of dissection for ethical reasons. Unfortunately, such policies are not ubiquitous yet; in the U.S., only 18 states and the District of Columbia allow students to choose alternatives. Even when such policies exist, teachers and students may not be aware of them. The Faunalytics/NAVS study mentioned earlier showed that only 53% of educators in states with student choice policies knew about those policies. The same study found that 38% of students didn’t know if alternatives were available to them. Thanks to the work of anti-vivisection groups, this is changing. If you aren’t swayed by the ethical arguments against animal research, perhaps this will change your mind: Approximately 100 vaccines have shown effectiveness against HIV-like animal viruses, but none prevent HIV in humans. Up to 1,000 drugs have shown effectiveness for neuroprotection in animals, but none for humans. While the biomedical research industry is quick to claim victories, the reality is less glamourous: nine out of ten drugs fail in clinical studies because they cannot predict how they will behave in people; only 8% of drugs tested on animals are deemed fit for human use; one meta-study found that animal trials overestimate the likelihood that a treatment works by 30% because negative results often go unpublished. Fortunately, using animals in scientific research is not a foregone conclusion. On the contrary, there is a burgeoning field of alternatives to animal research, and many such alternatives are already in use today. The above graphic shows a small selection of some of the most exciting and promising alternatives to animal research that exist today. There are many others that are available, and even more are on the way. Among the many organizations and institutions working on better alternatives are FRAME, INTERNICHE, and Animalearn who are leading the way in promoting clinical and educational alternatives. This Faunalytics Fundamental has provided a visual overview of the use of animals in research. The result is a complex picture: public opinion is mixed and context-specific; the number of animals used is a guesstimate due to lack of reporting for certain species; and laws are not keeping pace with students’ interest in dissection alternatives. The scientific establishment has a lot of inertia in favor of continuing the use of animals in research, but is slowly shifting towards alternatives. How can advocates galvanize the majority of the public that believes research animal welfare is important and guide them towards supporting elimination and alternatives? Looking a public opinion research such as this and this can help advocates to target different public audiences on a case by case basis. What can animal advocates – and members of the public – do to contribute to the development of research alternatives? Education about alternatives and their effectiveness is key. Public opinion for various animal research issues is somewhat contradictory and confused. What are the most effective ways that advocates can clarify the issues? First, animal advocates needs to educate themselves on the science, and then communicate that effectively. As animal research regulations become more stringent in some parts of the world, “outsourcing” to laboratories in other parts of the world becomes a bigger issue. How can advocates anticipate and prevent this trend? We hope you find the above information useful in your advocacy for animals used in research. Check out all the sources here.